There has seemingly been a sense of tension between Man Utd boss Jose Mourinho and Paul Pogba in recent months, but it would appear as though things have eased. As per The Telegraph, things were arguably a little frosty between the pair as Mourinho discussed his midfielder’s future at Old Trafford following on from comments he made during the international break. Perhaps it stemmed from the World Cup winner suggesting that he wasn’t entirely happy at Man Utd, as noted by The Guardian, while results on the pitch weren’t helping to ease the tension after consecutive defeats to Brighton and Tottenham. However, the Red Devils have since turned things around with wins over Burnley, Watford and Young Boys, and it appears as though the mood is improving across the board. After missing a penalty against Burnley, Pogba stepped up and slotted one home in Europe in midweek, and he specifically thanked Mourinho for his continued faith to have the confidence in him to take the next one. “I didn’t have doubts about taking the penalty. I know I missed that one. Joe (Hart) got me that time but I won’t do the same mistake,” he is quoted as saying by Sky Sports. Ultimately, this is positive for United. 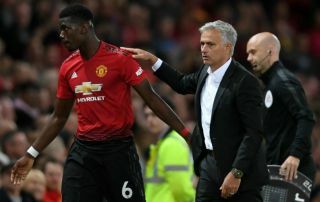 Pogba has an instrumental role to play in their success this season, and so having him and Mourinho on the same page will be key, with speculation suggesting otherwise as noted in the reports above. Provided positive results continue to arrive and Pogba is a driving force behind that with Mourinho able to rely on him consistently, it can surely only mean that the Manchester giants will continue to move in the right direction in their pursuit of major honours this season.